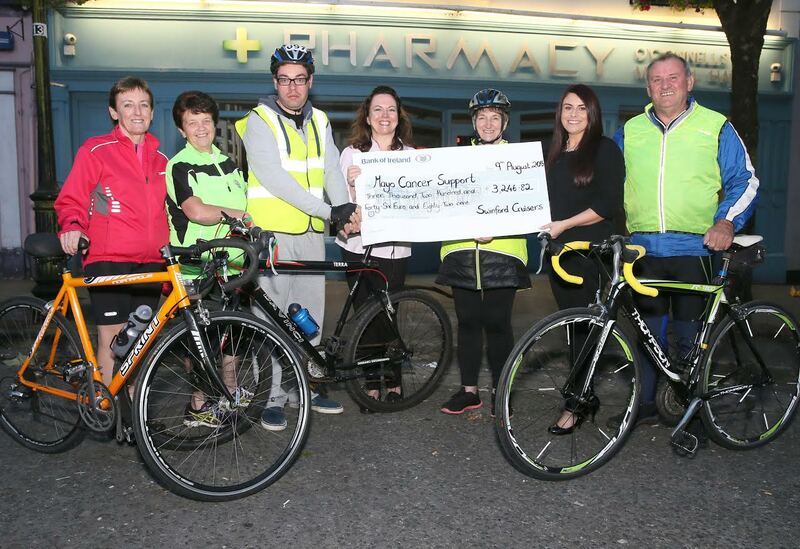 Just some of Swinford Cruisers Cycling Club who organised a cycle from Swinford to Donegal recently in aid of Mayo Cancer Support Association, Rock Rose House, Castlebar. Pictured are Helen Lenehan, Mary Teresa Loughlin, Brian McNicholas, Mary Shiel-Winfield, Mary Smyth, Trisha Greavy from Rock Rose House and Pat Moore. A total of €3,246.12 was raised. A huge Thank You to all the organisers, cyclists and sponsors for all your help. Your generosity allows us to provide all our services free of charge to people with cancer and their families.